A chicken-sized bird originating from Africa, the guinea fowl is prized by many farmers and homesteaders throughout the United States for its ability to consume vast quantities of bugs, including garden pests and disease-ridden ticks. The bird is also valued for its pheasant-like meat and nutritious eggs, and its watchdog-like tendencies. On the down side, guinea fowl are noisier than chickens. Both male and female guineas will regularly produce high-pitched calls, especially when alarmed. For this reason, young guinea fowl are typically noisier than older guinea fowl that are more comfortable in their surroundings, Manchester said. And females are generally noisier than males; so if you only want guineas to eat ticks and other bugs — not for eggs or to produce keets — he suggests investing in a group of males. Ticks, a family of bloodsucking arachnids that can carry and transmit a variety of diseases to people and pets, are becoming an increasing problem throughout the country as certain species of ticks expand their ranges, and the more tick-borne diseases are being discovered. In response, people are seeking ways to rid their properties of these dangerous pests, or at least lessen their numbers. And that’s why many people are now pursuing guinea fowl, Winter said. But that’s not all guineas are good for. They were originally domesticated for their meat and eggs. Winters describes guinea meat as darker than chicken meat and “a little peasant-like, but not quite as dry.” And guinea eggs are about ¾ the size of chicken eggs and have a larger yolk to white ratio. 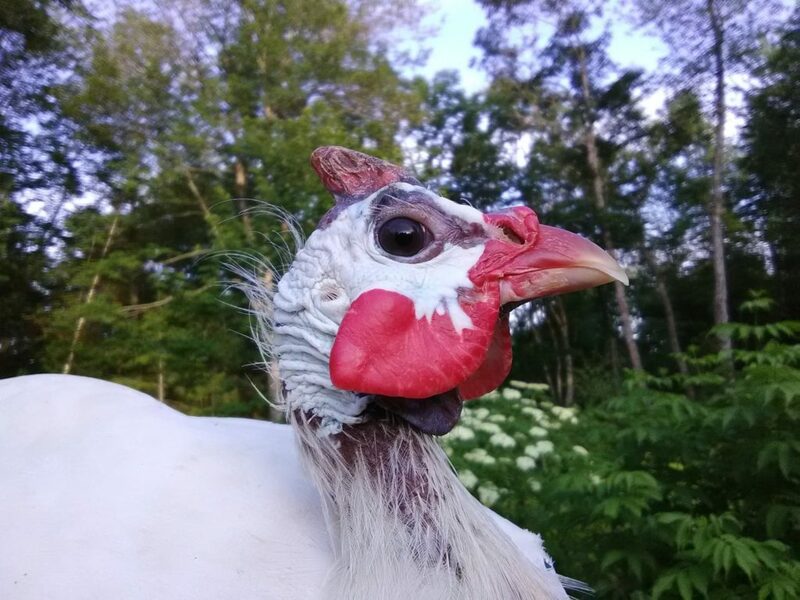 Another role guinea fowl can play on a farm or homestead is as “watch dogs,” alerting you to predators and other visitors.